We have now moved on from Lymington to Poole. The marina we are currently at is nestled behind two bridges which open on the half hour, if needs be. Another first for us - getting in position in time for a bridge to open, which needed a little harder of a push on the throttle than we usually use for that last twenty minute 'sprint' to the bridges. In the event, the bridges were lifted solely for us, with the first bridge looking pretty normal for a lifting bridge. 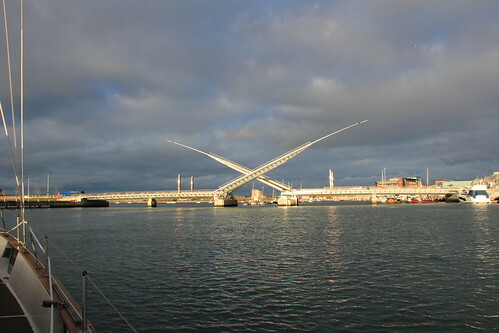 The second bridge lifting, which you can see in the picture, turned out to be an unexpectedly magnificent performance, perfectly highlighted by the late afternoon sun. If we had missed this bridge opening, we would have been fumbling our way into a strange berth in the dark, again. Turns out this was a good thing, as the marina berth numbers were all but impossible to spot, even in the daylight. Last weekend we walked out to Hurst Castle. It was a somewhat strange feeling sitting on Hurst Castle, sheltered from the wind in a warm sunny spot, watching the water from the Solent rushing out through the narrows there. I've been backwards and forwards through these narrows by boat several times now, but not really appreciated just how powerful those currents are, until sitting there watching them from the shore. 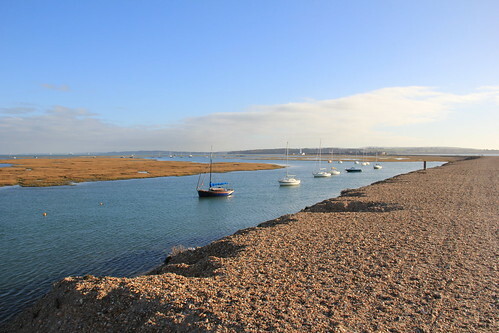 The picture shows the waters near Keyhaven, looking along the narrow spit towards Hurst Castle. The white tower is the lighthouse, with IOW in the background. For the longest time, I've been talking about having a boat, floating about and having a laugh. Up until recently, much of this has been focused on the boating side of things, now it's time to move on. In September, we gave notice at our 'home' marina - where I've kept a boat of some sorts for over five years I think it is. That initial letting go was tough, as we leave that comfortable familiarity and those friends behind. So far we have made it as far as, well, Lymington - a few miles down the Western Solent. Ok, so October the boat was out the water, which means that does not really count towards the dream. As we did with our move round to Beaulieu last year in December, we are loving it down the New Forest way - especially at this time of year with all the trees changing through their autumn colours as they are. This adventure has, so far, been less about boating, other than using the boat as a base, and more about enjoying the area the boat is currently at. Yesterday's memorable walk along the Solent way, down towards Newhaven, being one such example of living the dream. Oh yes, and the excellent food, part of a long, lazy lunch, at the King's Head in Lymington really deserves a mention. Hmm, the picture did not quite come out as planned. Still, if you look closely you will see that the big sail that is normally furled up at the very front of Arctic Rose is off, and lying on the deck. The wire where the inner, staysail, goes on behind that foresail has now been replaced with a new roller furler mechanism. I put the staysail on just after this picture was taken. The beauty of having the staysail on a roller furler means it gets to be used more, and also frees up space where the sail used to be stored inside the wheelhouse. I'm also hoping that having a bit more bulk in place of just the staysail wire will help prevent the foresail from hanging up on that same wire when tacking (we shall see). One thing is for sure, although it's only a few additional ropes on deck all the time now, the whole sailing arrangement seems that much more 'messy'. Once we get the ropes/sheets all running sweetly, things will no doubt settle down. The dirty ropes you can see in the picture is my old running rigging (sheets and halyards), which have been somewhat overdue for replacement, while the nice clean ropes at the top of the picture and in the foreground are the new ropes. It's only when I see the ropes off their usual places, and coiled like this, that the sorry state of them is truly evident. Trouble is, the new running rigging is almost too good to use - for fear of getting it all dirty already. 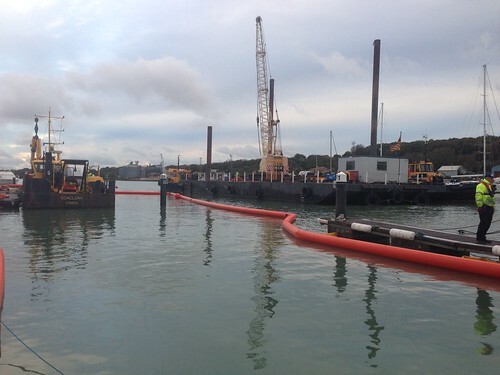 The picture shows some of the equipment brought in to recover Kahu after she caught fire and sunk at East Cowes. Apparently there is still an industrial strength crane to be brought in, which will lift the wreck of the Kahu onto the barge for an ignominious end to someone's pride and joy. I'm not too fussed about the owner who, if you think about it, is not inconvenienced and is likely to get a big fat insurance payout. Easier than selling the boat I suppose. Rather, my sympathies lie with all the other people who have been hard impacted by this, including the marina, local residents and boat owners. On a separate note, I'm not convinced the recovery needs to be such a massive operation. John agrees, and suggests to simply raise the wreck with airbags at low tide, gently float the whole lot to a convenient slipway at high tide and then deal with it all from there. 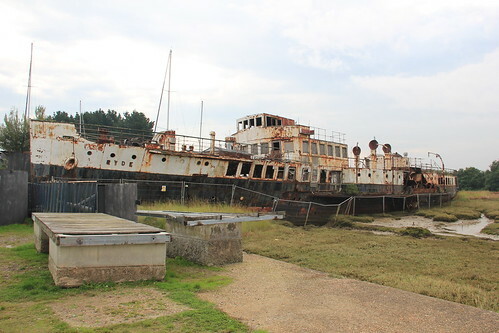 One other thing that occurs is, if it burned for over eight hours, did anybody think to fetch one of the big tugs with powerful monitors over from Fawley, less than an hours steaming away? I bet the fire would have lasted no time against that kind of onslaught. All the washing, brushing and painting has now been done and Arctic Rose is now back in her natural element again. 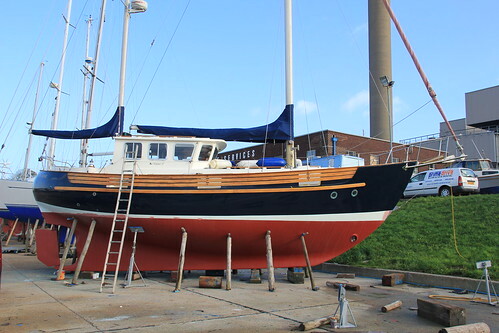 This is the time I fear the most - bumping her up alongside and making a mess of the beautiful new finish before we get to enjoy the benefit of all the hard work done, by others, in the last month or so. My days on hands and knees polishing/scrubbing/stripping/polishing/painting for hours on end are over. I don't mind doing the odd job, but nothing like I used to do. 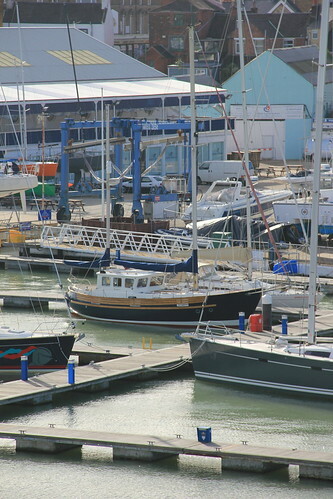 Here you can see Arctic Rose nestled in alongside at W. Cowes, awaiting the attentions of the riggers who are doing a much needed replacement of her running rigging. This picture was taken from the ferry, on our way back home after a fun weekend exploring the far side of the IOW for a change. 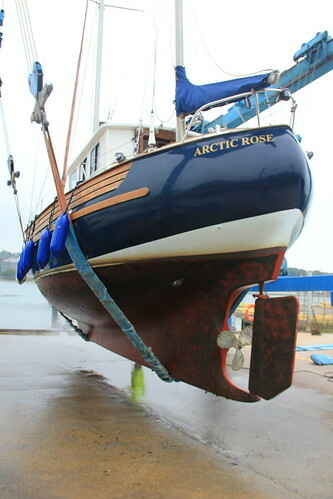 Here you see Arctic Rose, after some tender loving care while she has been ashore. All that's left to do here is sorting out the rough edges on the white bits that mark top edge of the waterline. The boot top it's called. She is looking pretty good, even if I say so myself. I talked about doing this over a year ago, but never actually got round to it. Finally, Arctic Rose has a set of matching fenders, with matching fender ropes as well. The fenders looked plenty big enough in the shop, but after hanging them over the sides, they suddenly looked a bit small. They'll be fine, I'm sure. Better than the dirty, mismatched set of different sizes and colours we had before anyway. Here you see Arctic Rose out the water again. Last week we took her out the water for her annual wash and brush up. It's slightly overdue, but only by a few weeks so nothing to worry about. You can see the underside before she has been jetwashed, so not too bad on the whole considering. Although the list of jobs is quite long, most of them are really very trivial, such as touching up the paintwork, cleaning up and re-coating the woodwork, servicing the engine etc. I'll also take the opportunity to replace some of the really old, and in some cases frayed, sheets and halyards. 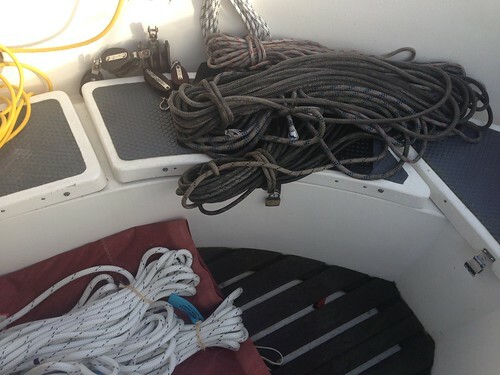 The biggest single thing to be done will be to install a roller furler for the staysail, as it almost never gets used as it's such a hassle to deal with. 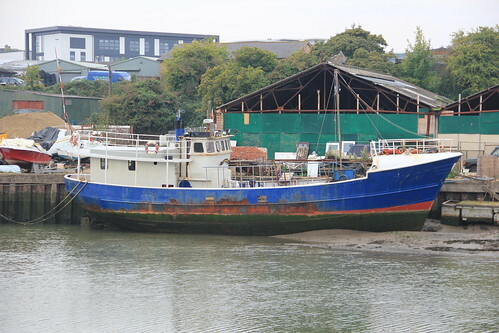 No, no, don't panic - I've not gone and bought another one, just wanted to show you this trawler we saw up towards the end of the River Medina, on the Isle of wight. I know nothing about it, but it does have a remarkable resemblance to Lady Jane (see previous post by way of a comparison). I'm sure things are very different inside though. 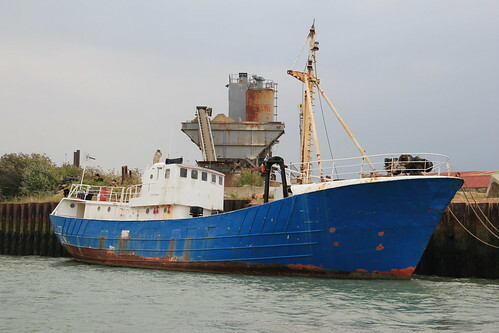 The other week, when we were in Portsmouth Harbour with Arctic Rose, we took a small diversion to go check out poor old Lady Jane, my old ex trawler. 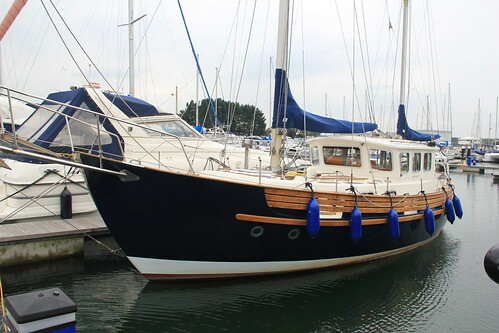 Sure enough, there she was, lying abandoned and looking pretty sorry for herself, listing somewhat to port. I'm pretty pleased at how the paintwork has stood up, considering it looks like its been years since she was given any tlc. Looking closely, I can also see a few new dents and scrapes. Still, at least she is still afloat and, presumably, the engine and other machinery is still in good condition. Seeing the old girl like that, I have absolutely no regrets at all at dumping her and buying Arctic Rose. On our walk up from Island Harbour to Newport, on the Isle of Wight, we saw this little beauty right at the top of the River Medina. 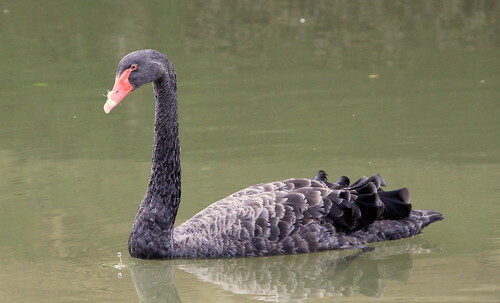 That I can remember, this is the first black swan I've ever seen. The plan for the weekend was to whizz? 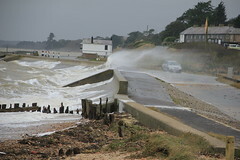 over to Bembridge again, because we like it there. 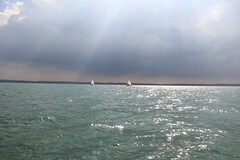 Mother nature had different plans for us, in that the wind over tide situation made for an uncomfortable journey out that way, so we swung about and headed towards Cowes. 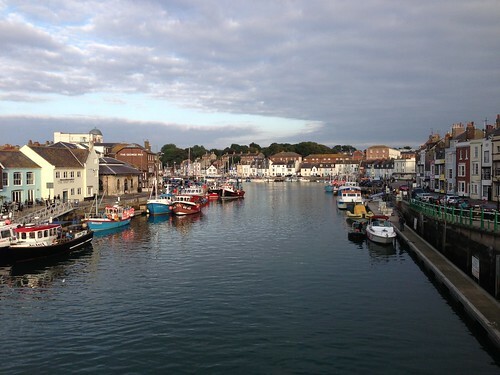 On the way into Cowes, Patch suggested we try going to Island Harbour, which is situated up the far end of the Medina, almost at Newport itself. This turned out to be an inspired suggestion, as the place was really great and proved to be a handy setting off point for a really picturesque walk up the Medina to Newport itself. It's the first time we've been through a lock with Arctic Rose, adding a frisson of excitement to our adventure. In the end, with neap tides and plenty of cheerful help, locking in and out was actually quite a pleasure. As an added bonus, we were made extremely welcome by Steve and Barbara, of Wight Mistress, who are also Fisher owners and based there when not out and about travelling. Island Harbour is certainly destined to be another favourite destination of ours. For those who are interested. 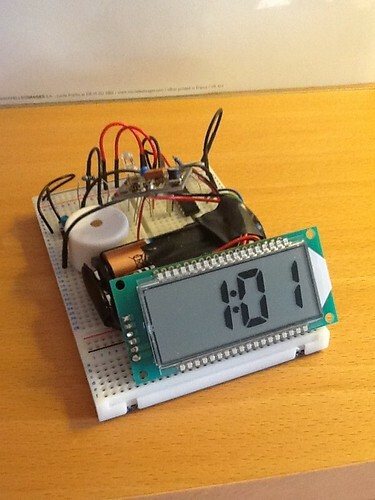 Here is a picture of the timer from when it was still mounted on it's breadboard. A cover makes all the difference. The timer is developed on a PIC18F13K50, from Microchip, with a 31Khz crystal harnessed for accurate timing. Other than the display, a buzzer, an LED and a few switches and batteries, there is not much else to it really. Finally my timer is complete. This has been a while in the making, as many of you who know me are aware. The history behind this timer is from the desire to make regular log entries as we are travelling in Arctic Rose. The logbook serves as a handy reminder of our various travels. The issue I have with alarms and other timers I've seen is that none of them track total elapsed time, while sounding an hourly alarm which sounds until cancelled. I had written the microchip code and had the whole thing operational in rough form on a breadboard for some months. In the last few weeks I finally made the time to put it all in a proper box with decent switches and buttons. For those of you really interested, the top left hole is where the buzzer sits, with the on/off switch at the top right. 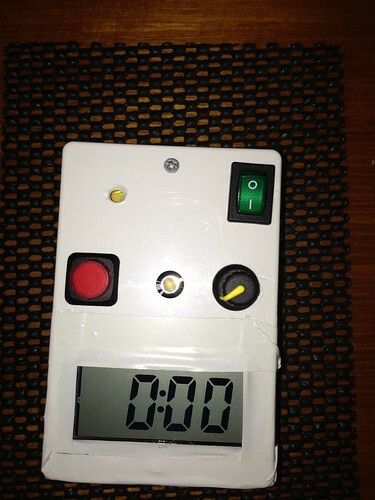 The red button is the alarm reset, while the led flashes, in time with the buzzer, when the hour is up. If you are still with me, the knob you can see there on the right is for the screen backlight. The whole thing works amazingly well, also giving a convenient total trip time on arrival. We were back in Newtown Creek this last weekend. This is one of our favorite destinations on the Isle of Wight. Last year, almost a year ago now, we were told by the National Trust man that comes to collect our money in his little boat, that there was a seal about, but we've not seen it until now. That's something I've generally noticed, that in our various travels we have not seen any marine mammals. Hopefully, this seal siting is the start of the change of all that. 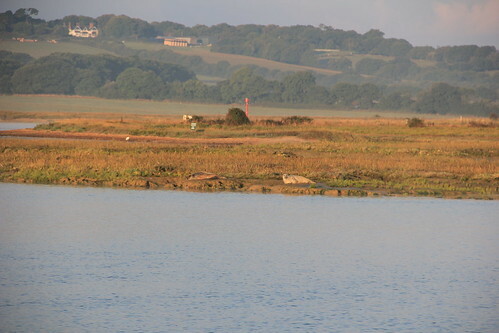 Oh, the seals really are there in the picture. You have to look closely though, as they are hard to spot. Hmm, I'm not sure what happened but I seem to have destroyed my original blog template, so everything looks a bit bland now. I had been meaning to do some tidying up on this blog, looks like I will have to do it now. Well, when I have the time to do it that is. Along with friends Mike and Glen, I went on another mile builder weekend on a different boat this last weekend. 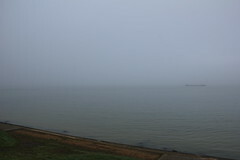 The original plan was for a cross channel trip, likely back to Cherbourg, but the weather had other plans for us. Instead of a 10.00pm Friday evening departure, which would have meant a windy, rough, channel crossing, we opted for an early start trip with the tide across to Weymouth. Things worked out just perfectly, with great winds, a laid back skipper and a stress free adventure. We even had time to practice our sailing skills before tying up then settling into one of the local hostelries for the necessary food and drink, not too much though as it was to be an early start for the return trip on Sunday. Arriving at the entrance to Portsmouth harbour recently, we were greeted with this amazing sight. All the kites looked so calm and serene hanging in the air like that. I'm guessing it was not so calm and serene if you were there, flying one of those beauties in amongst all the others on the day. The sight of all those kites is, I'm sure, best seen from the sea. Though it would have been fun to be there. While on a mooring buoy in Portsmouth Harbour recently, we saw these guys come past. 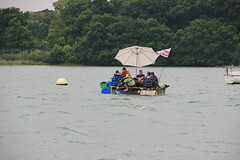 I can only presume they were escapees from the annual Fareham Raft Race. I have no idea how far they got, but did see their 'craft' being towed back in the opposite direction the next day - so presumably they made it to civilisation. The weather we have been having recently has been superb. A proper summer here in the UK at last. Nothing like a bit of sunshine in our lives to cheer everyone up. Worth it? - I think so, if only for the memory, if nothing else. 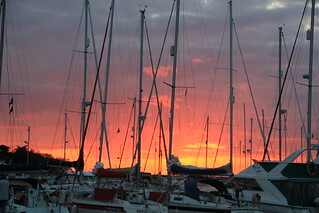 I've been away doing a preparation week, and the RYA Yachtmaster Coastal sail exam this last week. It seems like just a few days, but so much has happened. I really did mean to post more during the week, but the preparation week was pretty intense, so no time for anything other than the course itself. The exam result - I passed. It has to be said that the crew, some of whom were also doing their Yachtmasters exam, helped me enormously, and without them I would not have had such a happy result. 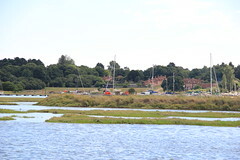 Both Patch and I love visiting the Beaulieu river. Here we are moored a little way further up the river, past Bucklers Hard, where there is less boat traffic on a busy weekend and it's so much more peaceful. During our last stay a few weekends ago, Andy joined us and also brought his canoe. By way of history here, I've been seeing kayaks and canoes of all shapes and sizes being paddled about at places we go in Arctic Rose, so have been surreptitiously eying prices of various models for the last few months. As Andy was bringing his canoe, I thought "it's time" and while we were in Lymington, we bought an two person inflatable kayak. 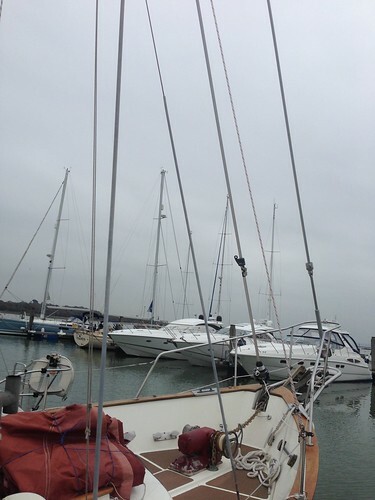 The guys at Yachtmail Chandlery could not have been more helpful. It's such fun being able to nose around places we would not normally be able to get to. More on that later. We are still sailing regularly, and enjoying the unexpected warm summer weather. 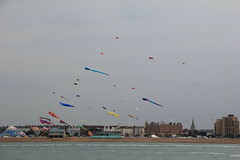 There were apparently hundreds of gaffers over at Cowes this last week. 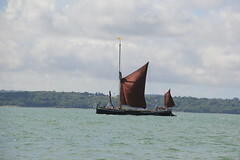 Sailing home from Bembridge, we got to see this beauty going the other way. No sailing this weekend just gone. The forecast for the next week or so does not look encouraging either. It was all pretty calm while we stayed at Newtown Creek over the weekend. 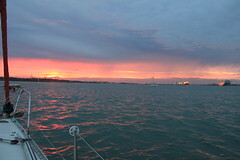 The plan was to leave just before ten, leaving plenty of time for a comfortable sail round to Southampton, getting back in time for easy tides as we came alongside. The forecast, according to windfinder.com, was for 12-15kn winds, steadily increasing over the course of the afternoon. I had checked the weather again that morning before we left. With the mizzen already up, in preparation for getting the main and foresail up smartly after leaving Newtown, Arctic Rose suddenly became somewhat more of a handful than expected, just when starting to navigate through the narrow channel out of the creek. Looking at the sudden jump in wind speed on the chart from the day, it's easy to see why. What should have been a comfy sail turned into a bit of a lumpy ride, with us fighting wind over tide up the Western Solent - I'm sure I saw 30kn on the gauge at one point. Needless to say, Patch was none too impressed with my planning skills and I never got any tea until we reached the relative calm higher up Southampton water. I've been away travelling for work, hence the silence. 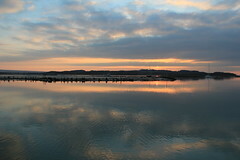 Back now, and what better place to head for, to enjoy a bit of tranquility, than Newtown creek, on the Isle of Wight? This picture was taken on Saturday evening, it speaks for itself.